Graph It employ the services of Carlin International in devising the contents of the Trend Sets. Carlin are a gobal trend forecasting agency who advise leading brands in many sectors inlcuding home, fashion and car manifacturing on colour trends for the forthcoming seasons. Graph It Markers have a unique triangular shaped body making them more comfortable and easier to use than the more traditional round shaped barrel. They have a high quality Japanese made Chisel Nib at one end and a Fine Detail nib at the other, making them ideal for both large and more intricate studies. They will also last longer than many other brands with approximately 20% more ink. The coloured end caps with bold colour codes makes colour selection easier in store and when in use. There are 165 colours in the range and they have an easy to follow numbering system to help colour selction even easier. 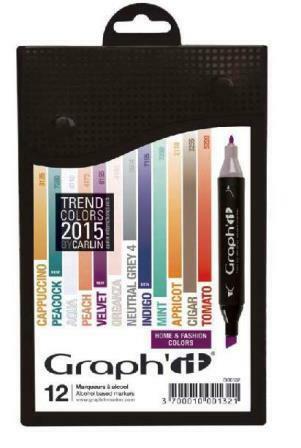 Click the button below to add the Graph It Marker 2015 Trends Set to your wish list.